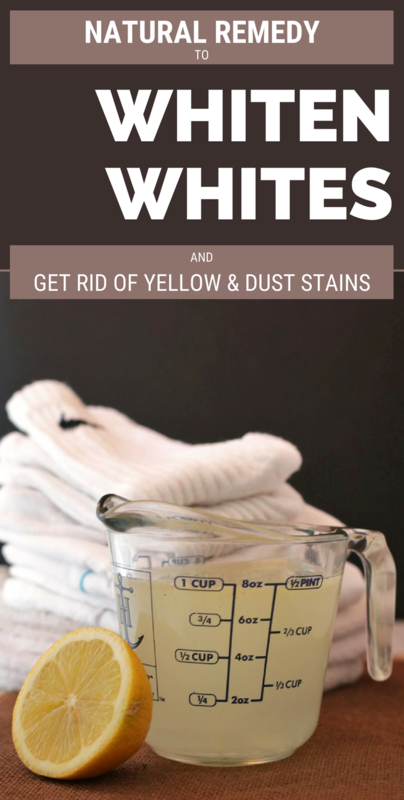 When it comes to get rid of yellow stains on white clothes, the most important thing, before resorting to the following natural method, is to leave your clothes to dry in the sun. This trick enables the whitening process. Due to dust and dirt, white clothing tends to become very yellowish. Although we have many chemicals products that can help us to solve this problem, it is best to resort to natural methods for bleaching clothes that don’t damage fabrics. The next solution with hydrogen peroxide and lemon juice gives the natural whiteness of the laundry, especially if they are stained with dust or food residue. Pour water into a container and add hydrogen peroxide and lemon juice. Soften the laundry in the prepared solution or add it in the washing machine when you do the laundry.